Yes, making the All-Star team is good for Luol Deng and good for the Bulls organization. But the addition of the Bulls’ eighth year veteran is even better for the NBA because it sends the right message about the game, that if you are unselfish and give of yourself and care about winning you will be rewarded. Deng isn’t having one of his better statistical season, averaging 16 points. He’s averaged more four of the past five seasons. His shooting percentage is the lowest since his rookie season. He doesn’t do much to excite the fans, and Deng laughed about that in saying he’s not even sure what to do in Orlando in two weeks for the big game. “I’ll talk to Derrick (Rose),” Deng said with a smile. “I don’t know what you are supposed to do, how it goes. Am I supposed to play D? 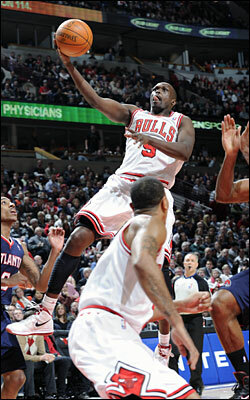 No, Luol Deng isn’t going to throw it to himself off the backboard or do some sort of windmill dunk. Yes, the All-Star game is an exhibition and a show, and there should be plenty of that. And it’s good to see. But it’s also good to see someone can be recognized for being a crucial element to winning, that giving yourself up for the good of the group will result in individual rewards. It’s a great role model lesson for everyone. Even as Deng got notice Thursday night with the TNT awards show that his long awaited “star” designation was official, Deng demonstrated just why he is so valuable. Reporters try to get comments or so called “scoops,” perhaps the first one by minutes to have a word from Deng on the big news. No, Deng told the Bulls, he’d rather wait until practice Friday when all the reporters could get there so it would be fair to everyone. While Deng is a rock of consistency now for the Bulls, the coach’s life preserver, it’s been a tale of uncertain times during Deng’s eight years in Chicago. Never quite celebrated, occasionally maligned, often overlooked, Deng has remained stoic. More than anything, he’s persevered to where he is now officially considered among the elite of his profession. Deng becomes the 14th Bulls player ever to be an All-Star and this is the 12th time and first since 1997 when the Bulls will have multiple All-Stars at the game. That it finally came for Deng is both unexpected and deserved. Rose said he and Deng talked about it when the team was in New York last week and Rose said he told Deng that he was confident the way Deng was playing that Deng would be joining Rose in Orlando for the Feb. 26th game. You could see Deng, generally unemotional, quietly bursting with pride about his selection. He’s not one to draw attention to himself, which defines his play. But he’s also someone, which is quite human and normal, who wants to be recognized for what he does. You can see he’s the kind who believes you work hard and you will be rewarded. But as we know, life is often unfair and the guy who shouts the loudest often gets the attention. Deng’s game is more a quiet melody, subtle but endearing. “There were years in the past I felt I played like an All-Star,” Deng said. “Maybe some guys had a better year and made it over me. It’s really been an up and down kind of career. To be there, a lot of people see it as your best year. I feel like it’s one of the best years I’ve had (because of the team success). Deng said he’s always gotten positive feedback, if more from insiders than viewers. Still, it’s always been uphill in the climb toward recognition, and for Deng, personally, it was a long way up from the playoffs of 2009, that magnificent seven-game series with the Celtics. Deng couldn’t play with a stress fracture, and there were whispers that it wasn’t that serious. His future with the Bulls was cracking worse than his foot. “To watch one of the best series, against Boston, I’ve ever seen. To know I’m on that team but couldn’t dress and play, and sit there reading everything, the papers, fans, everyone saying that I was not really hurt. To me, that was the lowest point and craziest thing I ever had to go through,” Deng said, turning serious for the moment. You could tell it was life changing for him. Not that it compared to his family’s race to safety from the Sudan civil war. But it was his first vivid demonstration of the vagaries of celebrity. And then everyone went home and Deng went to the gym. He said every day he’d pack a lunch, go to work out, eat by himself, go back and work out more and then go home. He was determined to show everyone, to prove to himself as well. And so the trade talk grew, but Deng blocked it out. He said he never allowed it to dominate him. He did. He expanded his shooting range to three pointers. His ball handling improved as did his defense. And the environment improved. And then you are rewarded. That is the best example you can have for the game. There may be no more important All-Star for what the game should mean than Luol Deng.